Pedestrians distracted using mobile phones or noise-cancelling headphones should face a $200 fine, according to the Pedestrian Council of Australia. The call comes as the Brisbane City Council introduced a raft of new measures to improve pedestrian safety. Those measures include additional scramble crossings in the CBD, reduced speed limits in pedestrian-heavy areas and "senior citizens' safety zones", where there are higher concentrations of older pedestrians. Pedestrian Council of Australia chairman Harold Scruby said state governments should introduce a new fine of $200 for pedestrians caught using electronic devices while crossing road - even if they're crossing at a green pedestrian. "It should be a $200 fine on-the-spot (for crossing a road while distracted)," Mr Scruby said. "A green light doesn't protect you - pedestrians need to be vigilant about the dangers. "The fine for not wearing a bicycle helmet in NSW is $450. When you put it in perspective $200 is pretty cheap." 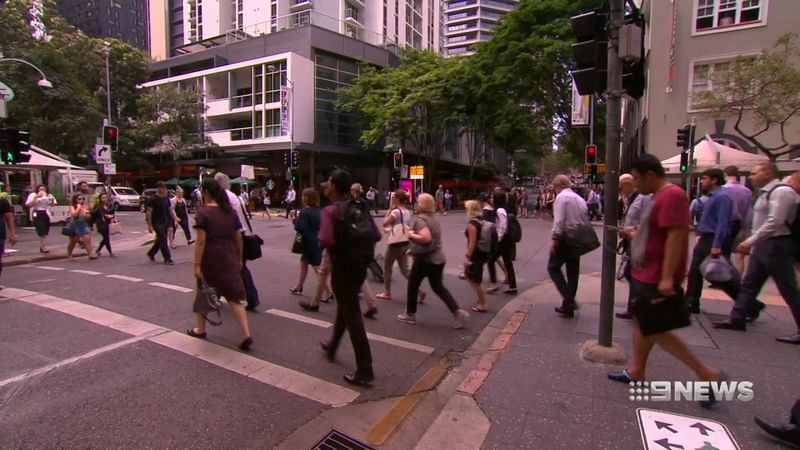 Authorities in Queensland and Victoria have reportedly ruled out introducing new fines, despite the Brisbane City Council today releasing footage of pedestrians narrowly escaping collisions with traffic at three major CBD intersections. Councillor Amanda Cooper said the footage, captured over a one-week period, highlighted the need to improve safety measures for people travelling by foot. "We did see some pretty distressing footage of people taking some very, very big risks," she said. "We really want to urge people to cross safely, to be aware of the environment around them - don't be distracted and don't take risks that are completely unnecessary." The council has announced speeding limits will be reduced on four major CBD and suburbs roads early in 2019 - Ann St in the City, Oxley Rd in Corinda, Mains Rd and McCullough St in Sunnybank, and Old Cleveland Rd at Stones Corner. Also being introduced are new Senior Citizens' Safety Zones on Beaudesert Rd at Moorooka, and Old Cleveland Rd at Stones Corner, where signage will be improved to alert drivers of "slower-moving" pedestrians" and crossing times for pedestrians would be increased. A council statement said the areas had been deemed to be highly concentrated with pedestrians aged over 60, with eight significant pedestrian crashes having occurred at the two sites over the past 10 years. Opposition Councillor Jared Cassidy criticised the council over the release of the footage, labelling it "victim-blaming", and said the new rules did not go far enough. "This footage shows pedestrians and cyclists need more priority in our CBD," he said. "Smart cities around Australia and across the globe are handing their CBD streets over to the people who use them most - pedestrians. "If you want to stop the accidents and the near-misses, slow down the cars and give pedestrians and cyclists the space they deserve."